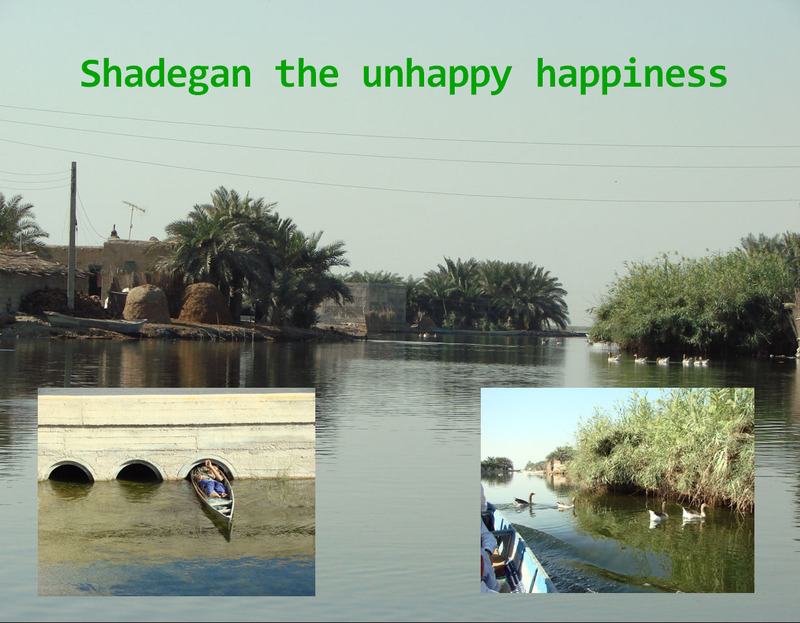 Combating Desertification » Shadegan the unhappy happiness! We rode the boat throug narrow passages until we arrived at a big open space. This open space was surrounded by a circular wall of reed bed. Through the change of small and big spaces a beatiful visual effect is created. Then we arrived at the ابوالفار (Place of mice). There bulls bathed themselves in the still waters of the wetland. So in my opinion Mr Darvish forgot one species of the mammals’ population, the tiny mice. Here I take the opportunity to thank Shahnaz and Elena for their beautiful reviews and their wonderful comments. hopefully they will go on collaborating with us and will generously share their wisdom. Hi mohammad its great….great …congratulation ….congratulation. I am so happy that your English blog started and full thank you from your friends who help to translate. I am sure that you will became prominent person in all of the world. I enjoy from this word” Haplessly=شوربختانه” . Thank you very much Hamid; however, the intention behind starting this blog is by no means fame. Here, we are trying to open an illuminating window towards our ecosystem which now faces a critical condition. Today was a day in the memory of Mr Kambiz Bahram Soltani, so I begin my comment with the memory of his flying ghost over all Iran’s wetlands. As Mr Darvish wrote about 100000 locals of the wetland have few opportunities and alternatives to earn income. They’re just poor. ” I saw women on the shores constantly looking at us. As we arrived at the shore, they came to us and offered us water, which showed their hospitality. I drank the water as an act of courtesy. The water is very salty and bitter and tasted bad, so the first sip was very hard to take. How could this poor people drink this water? They took us to their simple homes made of clay. The house didn’t have an entrance door, with a few rooms build around the yard. These people were so very nice to us without ever meeting us before and without any expectation. Even though these people have many problems and hardship they are content with even the smallest things. I asked a girl ” Do you have many problems here?” and she replied “Thank God, everything is all right, but we don’t have a High School!”. And I thought to myself: The Life in the Shadegan Wetland runs along with good and bad sides. Dear M.P, Though I believe no where goes as gray as Tehran goes these days (unfortunately), the way you mentioned the north shore of Germany was very poetic and nostalgic especially after linking it to memorial ceremony of Kambiz Bahram Soltani, one of Iran’s finest sons and a man who stood for his beloved environment until his last breath. Thanks to his esteemed friends and colleagues from Royan consultant CO. the ceremony was held splendidly and appropriately this evening. Details of the event will be posted later. This will start an environmental movement in Iran that could be introduced to the world that Iran’s environment. Global audience in a very positive step…! As I mentioned earlier, a splendid ceremony was held this evening to honor the memory of Kambiz Bahram Soltani. The highlights of the event were Mrs. Bahram Soltani’s speech to enumerate the deceased’s unique characteristics; Live performance of Iranian traditional music and finally the Dr. Fazel’s (deputy head of Iran’s Environment Conservation Organization) promise to name a building in Miankaleh after Bahram Soltani. Nice to see your website after almost so long. Reading, visiting writing, doing research on this wetland is making so many doubt in my mind. As environmental economist I was working on this wetland for long time. two researchs were done and I’m thinking has it made any sense? while there is no changes in management or revising in decisions or plocies which affected wetland directly or indirectly…what are we gonna to do? what’s next step? for sure we must do s.th before it totally disappear…bu what? how? It’s great to have sb with us who’ve been doing research on the wetland. We think there is still a good chance to do sth before the wetland disappears from the face of the earth forever. however, we need to inform people whether they are in charge or not. everybody, if familiar with the critical extent of the situation, will do their bits. we’d be more than happy if you could share your findings on the blog. anyway, for now WELCOME TO THE CLUB……. Thanks for very warm welcome. I wish some body finally hear us. Its my great pleasure to send you my recently published papers on shadegan wtland as soon as I can.